There are signs that restoration and excavation work on Egypt's famous ancient sites is returning to normal. 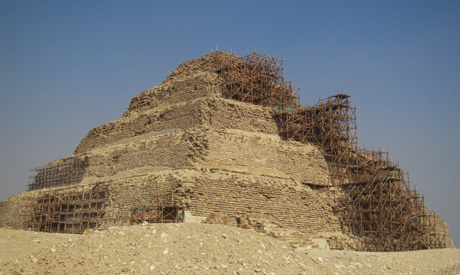 Following a nine month pause, the restoration of the Djoser Step Pyramid at Saqqara necropolis will be resumed next week. The Supreme Council of Antiquities has provided an amount of LE3 million to resume the restoration work. Mohamed Abdel Fatah, secretary-general of the Council, told Ahram Online that this fund was provided from the Council's revenue from tickets purchases at archaeological sites and museums. This fund will be sufficient to complete the required restoration work in the pyramid’s inner chamber, which is in at risk. According to Abdel Fatah, this is the only threat to the Step Pyramid’s structure as, according to the inspection committee, the pyramid is in a good structural condition. He added that the deterioration of the pyramid was due to climatic effects, environmental erosion factors and the leakage of subterranean water, not to mention the 1992 earthquake. The restoration plan includes consolidating the pyramid's underground tunnels, monitoring the cracks, restoring the wall decorations and inspecting the natural ventilation inside the pyramid and the southern tomb. A year ago a structural repair and reinforcement system was put into practice. This involved temporary structural support in preparation for more permanent reinforced steel rods to be inserted diagonally through the steps of the pyramid, knitting together the six levels. The Step Pyramid was designed by the architect Imhotep to hold the mummy of the Third-Dynasty king Djoser and preserve it for eternity. At the time of its completion the Step Pyramid was the largest building ever constructed, demonstrating a sophisticated and dramatic leap in architectural size and style.